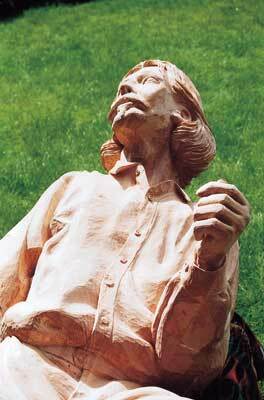 After delivering the Longitude sculpture of John Harrison for publisher, patron of the arts and poet Felix Dennis, I was commissioned to carve two figures, one of Robert Louis Stevenson, the other Long John Silver. These were to be attached to the main entrance portico of Highfield, the corporate palace of the Dennis publishing empire, designed by Felix himself. It reflects his own quirky, leg-lifting humour with a meticulous attention to detail. With an unmistakable Treasure Island theme, it is the largest wooden building to be built in England for over 270 years. I began the commission by taking measurements of the pillars in the main entrance and noting their relationship to each other and the building as a whole. 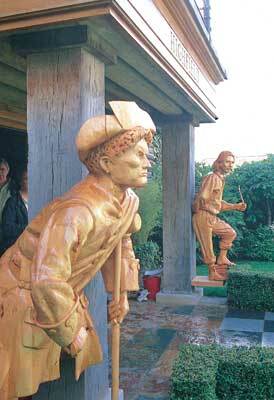 Making sure the sculptures are in proportion to the pillars, against which they will stand, is very important. In crude terms, they had to fill the gaps well. 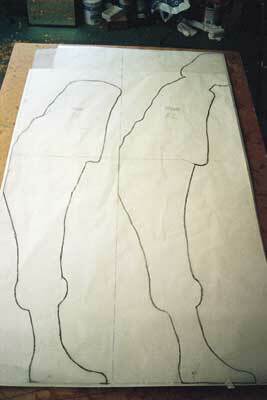 This of course decides the scale and from the measurements I recorded, these two carvings would have to be big! 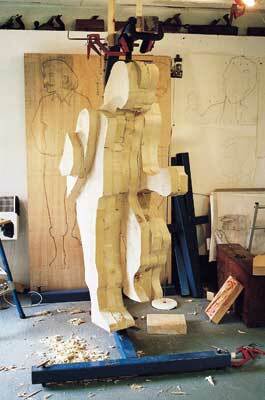 Scale and proportion are absolutely fundamental to the success of any sculpture. In this case it had to be right for the building, so I knew exactly how far I had to go in terms of block building to achieve this. For smaller work we often have to go the other way round and make our vision fit the block we already have. This is especially true for carvers that are inspired directly from the wood. This is rarely how I work - trees do not grow big enough, the right shape or sound enough for my method of large-scale carving. Once I had worked out the size I had to determine what the carving itself would comprise. 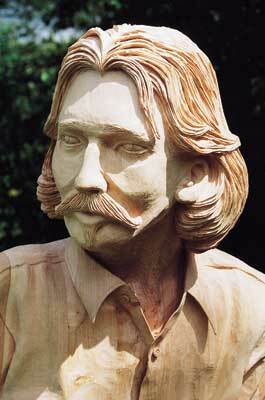 The Robert Louis Stevenson sculpture was to be as realistic and natural as I could make it. Being a fictional character, this wasn't the approach I opted for with Long John Silver as I wanted to create a real contrast between the two. There are numerous paintings and even photographs of Stevenson and while these were taken in the pioneering days of photography, they are enough to get a good impression of his countenance and stance, bearing in mind that being a consumptive he was dying for most of his short life. Silver is a different matter. He is of course a fictional character, depicted so well that he is probably more famous than his creator. When we think of pirates, Long John Silver is usually the first that comes to mind. As a useful preparation exercise I decided to re-read Treasure Island as an adult, which reminded me of what a fantastic adventure story it is. I had forgotten how exciting and powerful the written word can be, backed of course by the powerful illustrations of Mervyn Peake. On completing the book I have come to the conclusion that it definitely isn't for children! Highfield uses these very images. In fact I believe Felix owns them, and assuming they are his idea of what Silver looked like, it seemed logical to use them as the basis for my design. In his Highfield study, Felix has a portrait of Stevenson. It seemed right to extend this image to the main figure, so the sculpture would be cast in a way that was immediately identifiable to the client. This solved the problem of costume that consists of a casual shirt and baggy trousers. In the portrait the bare-footed Stevenson is clutching a distinctly shaped quill pen. We now have the figures fixed in size and style. The attitude or pose is the arty bit as it has to show all that I wish to say about these two characters and tell the tale well. I thoroughly enjoy the 'cryptic' aspect of my work and try to put as much of that into each piece as I can. 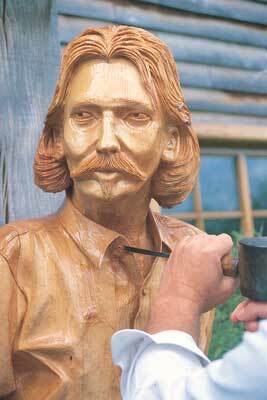 Long John Silver isn't just a pirate, he is Robert Louis Stevenson, or at least what Stevenson aspired to be. Although a frail man physically, intellectually Stevenson was a powerhouse with a broad imagination. The fictional pirate was thus all he saw in himself - a big man with "a face as big as a ham", curly hair, a missing leg and who was dextrous with his infirmity as obvious as Stevenson's weak chest was invisible. As both sculptures were to stand side by side, they had to be linked across the void very closely. This could be done with the gaze (eye contact), so I used this as my starting point. This then developed into the poses they now take; that of the creator casually leaning against the pillar with his foot on a pile of books, with his right-hand behind his back and his left clutching the quill, giving the impression of control over the fierce and aggressive Long John Silver. Silver is leaning forward, coming at Stevenson threateningly on his crutch, drawing his cutlass with a snarl on his face, dressed in a sea coat and distinctive tricorn hat. These details were taken from the Peake illustration. The impression created is that for all Silver's bluff and bluster, he is controlled by the quill from which he came, a classic example of the pen being mightier than the sword. So with the size, attitude and format decided, you now need a drawing that you can work from. I asked my good friend, the writer John May, to model for me. In this case John, being of very slender build, didn't see the irony in me asking him to double for a dying, consumptive man! Taken from the Highfield painting, Stevenson's costume was made up by the seamstress and extensive photos taken from all angles for the patterns to be made. I drew Stevenson in his pose, a front and a side view, loosely based on the photos which are useful guides only at this stage. The drawing has to work very well at this point. If it doesn't, its inadequacies will be magnified a hundred times in the finished work. It is from this rough drawing that everything comes. 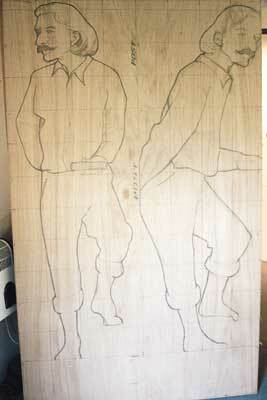 When ready, this drawing is squared up onto two 8 x 4ft sheets of plywood, one for the front elevation, one for the side. The 150mm (6in) grids were constructed using the height of 6ft 6in as starting point, the side view being a true projection. From this I was able to make an approximation of the amount of timber I required and ordered 22 cubic feet of 75mm (3in) limewood (Tilia spp.). This comes rough sawn straight from the tree (after drying) and has to be converted into proper, uniform planks and machined through all together in one run. This will help later when we glue up, plank by plank. 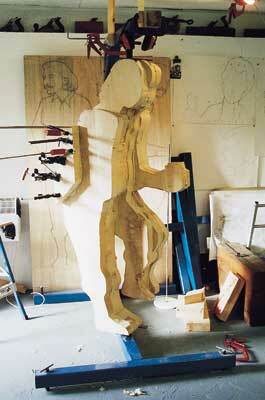 In order to deal with such a large piece, it follows that I have to be very strong. These blocks can weigh above a quarter of a ton and despite being fairly strong, I'm not that strong. So, anticipating difficulties from past experience, I realised that I needed something that can support the piece while I am working on it. Drastic situations require drastic solutions and I came up with a design for a rig that can be used for this very purpose. I took the design to Roy Holloway, a friend and agricultural engineer who turned my idea into a reality - a sturdy, well made rig coming with interchangeable extras just in case! Built from a 100mm (4in) square box section, it has an 'H' base for stability, upon which a very heavy-duty lazy susan bearing is mounted. The spine has an adjustable height facility and leads to a matching 'H' frame on the top. In line with the centre of the bearing is a heavy-duty threaded spindle with a screw plate. The block is secured on the swivel base and locked into place on the head using the top screw system, which is capable of being locked. This means that I can turn the work to any angle without any great effort, considerably reducing my heavy work burden. With that problem solved, the next thing to deal with is the pattern-making and gluing up. Beginning with the longest area on the front elevation, I accurately drew on the timber slices. In this case the 75mm (3in) stock came down to 70mm (2 3/4in) so they were drawn on for the whole of the work and numbered. Starting with the longest, it was projected through onto the side elevation and using a sheet of tracing paper, traced for the outline. This process was repeated for every slice. Once the patterns were done the tracing was laid against the timber for economy of cutting, the outline traced through and the shape bandsawed out. The first slice is used as the datum, being the only one that is glued up as a complete slice. All the others are added piece by piece and individually fitted. Taking account of drying times etc it can be a very laborious process. It is not a job that I greatly enjoy so I enlisted the help of another friend, Harold Johnson, a careful and painstaking retired amateur joiner. As these figures were to be outside, we needed to ensure that there was no way that water could enter. There was also the polyurethane glues we were using which required close fitting and tremendous pressure to work effectively. They are not only waterproof, but salt waterproof. Some of the smaller slices are then added whilst in the stock for ease of accessibility. With this done, we are now ready for the first cut. "When we think of pirates, Long John Silver is usually the first that comes to mind"